Yes, that’s to make bowls, spoons, buckets. I have one of these at home that belonged to my dad. 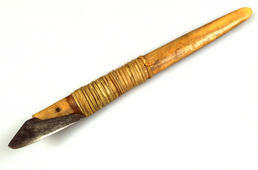 This is what you call miłqhaq [carver, curved knife]. Knives with curved blades are all-purpose tools, for shaving and whittling wood, hollowing out concave surfaces, and carving fine details. Anna Etageak: To make a spoon or something. Oscar Koutchak: Yes, that’s to make bowls, spoons, buckets. I have one of these at home that belonged to my dad. This is what you call miłqhaq. There’s a bowl over here somewhere, that’s how they make it. Theresa Nanouk: They carve the inside [make a concave surface]. Oscar Koutchak: They use this thing to scrape [surface of wood]. Oscar Koutchak: Yes, carve. The one my father had is made out of file. I’ve seen my dad making bowls and berry buckets. I don’t know what they used before this [metal blade] was developed, but this thing is widely used. 1. This entry includes discussion of curved knife E032880.